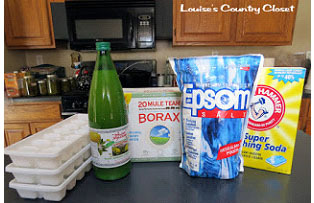 Make at Home Dishwasher Detergent if you want to keep your home free from toxic cleaners and that goes for food, cleaners, toothpaste, laundry soap, dish soap… just about anything. If you are having trouble finding a good dishwasher detergent that gets your dishes clean but aren’t toxic, and feel you have to wash things by hand …(Note: this work for hand washing your dishes as well) – what’s the point in having a dishwasher right? First, start by mixing all the powders together. 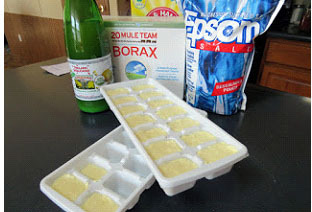 Make sure to mix it well you want it evenly spread through all the cubes If you’re not sure about the Borax, just eliminate that from the recipe, it won’t harm it at all. When everything is mixed put a cup of the powder into a separate bowl and then poured in a little bit of lemon juice. 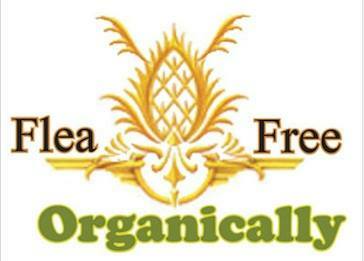 You can get two bottles of organic lemon juice from Cosco or similar stores for $5. You might be able to find it for less online. For one cup of powder use 4 tablespoons of lemon juice. You don’t want it to be dry but you don’t want it soaking wet either. 4 tablespoons made it a little wet and sticky which is exactly you want. The lemon juice will foam when it hits the powder. Mix it all in until it gets little sticky. 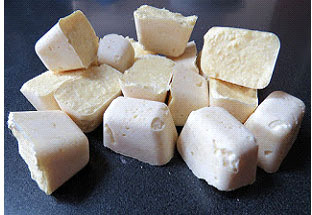 When you’re finished with that, start to add it to the ice cube trays. Put in a little and pat it down. When it was all done, Set the cubes up on the window sill in the kitchen so that it gets a lot of sun and dries quickly. Let it sit overnight so it gets nice and hard. When you wake up in the morning, you will be able to flip the trays over and knock the cubs out. If you live in a colder climate try putting in in front of the heater. Not so close as to melt the tray. Works wonders in the dishwasher! Add it to the list of things you can make yourself with no toxins! Take it one set further and add a little Smart Choice to disinfect organically!